Recently our attention was drawn to a small pamphlet entitled 'Guru Nirnaya Dipika' written by Mahant Krsna Balarama Svami, who considers himself to be a disciple of His Divine Grace Srila A.C. Bhaktivedanta Svami Prabhupada. In 'Guru Nirnaya Dipika' the author has strongly advocated that only a Vaisnava born in a brahmana family has the right to initiate disciples and confer diksa-mantras to them. Coincidentally, the author just happens to be born in a brahmana family. The author has gone to great lengths to prove his theory that the brahmana caste has a monopoly on imparting spiritual knowledge and has sifted through many sastras, extracting those particular verses that help substantiate his philosophy. However, despite his creating a facade of erudition, his essay is fraught with serious philosophical errors that are not in harmony with the opinions of the previous acaryas of our sampradaya. Unfortunately the bombastic boastings of the caste brahmanas and their mundane beliefs have again appeared to plague the world of Gaudiya Vaisnavism and it is somewhat ironic that this time they have seeped into the very line of Srila Bhaktisiddhanta Sarasvati Thakura..
POINT 1.) Only such perfect traditionally born qualified brahmanas can act as gurus for human society. REFUTATION: Firstly one should ask, what is a 'perfect traditionally born brahmana'? 'Traditionally born' implies that the garbhadana-samskara (ritual of impregnation) has been performed. This is one of the most important rites for a brahmana to ensure pure progeny. However, in this day and age, we see that most people born in brahmana families do not follow scriptural injunctions strictly, nor do they perform the duties of a brahmana (such as sandhya-vandana, tarpana, agnihotra etc). Added to this, the fact that many brahmanas tend to take up low-class professions such as clerks and salesmen, would seem to suggest that most brahmanas today do not perform the garbhadana-samskara anymore. Indeed, some who have been born into brahmana families even take the sudras occupation of a chowkidhar (night watchman) for the sake of money. However, when such fallen brahmanas discover that the occupation of a guru is more financially lucrative, they again turn to their so-called brahmanism with great fervor. "Those brahmanas who make a living from protecting cows, engage in trade, become artists, take the occupation of servants, and loan money on interest are no better than sudras." "If a brahmana cannot support himself through his regular duties and is thus suffering, he may adopt the occupation of a merchant and overcome his destitute condition by buying and selling material things. If he continues to suffer extreme poverty even as a merchant, then he may adopt the occupation of a ksatriya, taking sword in hand. But he cannot in any circumstances become like a dog, accepting an ordinary master." In other words, a brahmana may take up the occupations of the ksatriyas and vaisyas, but never that of the sudra. So, if one takes his birth in a brahmana family, and takes up the occupation of, for example, a night-watchman, then according to the scriptures, he loses his brahmanatva (brahminical status) and becomes a sudra. But if such a person later takes initiation from a bona-fide guru, he may again become a brahmana through the purifying process of initiation. "Just as bell-metal is transformed into gold by alchemy, a common man is transformed into a twice-born (brahmana) by diksa from a bona-fide guru." (Tattva-sagara, quoted in Hari Bhakti-vilasa 2.12). "Any person of any status (nrnam-sarvesam), if properly initiated with the correct mantras, can become a brahmana (viprata)." So, if a fallen brahmana can again become a twice-born through the process of diksa, why not one who was not initially born into a brahmana family? "We do not know whether we are brahmanas or non-brahmanas"
Such seminal pseudo-brahmanas of dim understanding strive to be acknowledged as (pseudo-) brahmanas and claim that if one is born in anything other than a pseudo-brahmana lineage, he can never become a Vaisnava acarya, bear the title of 'vidyabhusana' or study the sruti and other sastras. Their lack of awareness of the historical facts is extremely deplorable. Vidyabhusana Mahasaya was himself the person who smashed to pieces their speculative arguments. It is from vrtta-brahmanas (brahmanas by aspiration and engagement) that the lineage of seminal brahmanas sprang, who accepted the smarta-dharma established by Manu and other rsis. 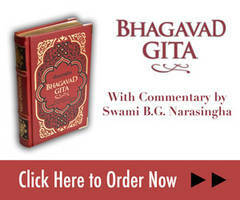 The Gita has taken a stand for the vrtta determination of varna against the above concoctions. Lacking in a working knowledge of the relevant portions of Mahabharata, Srimad Bhagavatam, the accompanying Gosvami literature, Agama-pramanya, Narada and other Pancaratras, Ramarcana-candrika and other paddhati literature, the Smartas of Bengal became an obstacle to the path of transcendental revealed sound. (srauta-pantha). Sri Thakura Narottama, Sri Raghunatha Dasa Gosvami, Sri Haridasa Thakura and other great acaryas have broken the elephant tusk-like form of the dry argumentative approach (tarka-pantha) of the empiricists. Srauta-pantha is another name for the path of devotion (Bhakti-patha). Tarka-pantha takes its birth in the appetites of unsurrendered atheists. Having obtained a clear understanding of all these truths, a reader of the Gita can easily traverse along the path leading to the highest goal of life. Only a Vaisnava who is dhirah (sense-controlled) is qualified to become a spiritual master. Nowhere in this verse does it mention that he must be born in a particular family or caste. In other words, any qualified brahmana can act as a guru for human society, whether he is a brahmana by birth (saukra-brahmana) or a brahmana by diksa (daiksa-brahmana). This is the opinion of the Gosvamis and their true followers. POINT 2.) The conversion of non-brahmanas into the brahmana order began in the early twentieth century by Srila Bhaktisiddhanta Sarasvati Gosvami Thakura to encourage everyone to take to spiritual life. Even though such conversions are accepted by the scriptures to allow one to advance in spiritual life, it does not allow converted brahmanas to function as gurus. REFUTATION: It is wrong to assume that the conversion of non-brahmanas into brahmanas only began in the early Twentieth Century with Srila Sarasvati Thakura. Throughout history, many personalities who came from non-brahmana backgrounds became brahmanas and functioned as gurus. The following is a list of personalities who were born in non-brahmana families who became qualified brahmanas and acaryas due to their qualities. "Visvamitra said to Vasistha: You are a brahmana, endowed with the qualities of austerity and Vedic knowledge. I am a ksatriya, so on the basis of my nature I will forcibly take this cow (Nandini). "Later, when Visvamitra was defeated, he declared that the strength of the ksatriya was inferior to that of the brahmanas. He thus decided that the performance of austerities was the only way to empower one with superior strength. "The greatly effulgent Visvamitra thus performed all kinds of austerities and attained the position of a brahmana." It is well known that Visvamitra was a brahmana by conversion, yet he was also a guru with many disciples. Amongst his most famous disciples who received mantra from him were Lord Sri Ramacandra and His brother Sri Laksmana, Sunasepha, and Galava. At present many brahmana families in India trace their gotra (lineage) to Visvamitra. Furthermore, Visvamitra is the rsi (seer) of many mantras of the Rg Veda including the brahma-gayatri which is chanted by all brahmanas thrice daily. In Chapter 30 of the Anusasana-parva of Mahabharata, the story is given of Maharaja Vitahavya who was originally a ksatriya king who became a brahmana by the mercy of Bhrgu Muni. His son, Grtsamada became a brahmacari and a brahmana sage who was equal to Brhaspati. Suceta, the son of Grtsamada, also became a brahmana. In this dynasty was born the sage Pramiti and Saunaka Rsi. Saunaka wrote many works on the Rg Veda and also wrote the Brhad-devata. He was also the guru of Sage Asvalayana. Asvalayana's disciple was Katyayana, and his disciple was Patanjali Muni. The caste of Satyakama Jabala was unknown, yet his guru Gautama Rsi accepted him as a brahmana simply due to his truthful nature. Satyakama went on to initiate many disciples, out of which Upakosala was the most prominent. Agnivesya Muni was born as the son of the king Devadatta, and the brahminical dynasty known as the Agnivesyayana sakha appeared from him. Both Medhatithi and Kanva Muni were born in the ksatriya dynasty of Puru. The sage Citramukha was born a vaisya, yet he became a brahmarsi with many disciples. "Does birth make a brahmana? No, this is also not the case. Many great sages have been born of other living entities. Rsyasrnga was born from a deer, Kausika was born from kusa grass, Jambuka was born from a jackal, Valmiki was born from an ant-hill, Vyasadeva was born from a fisherman's daughter, Gautama was born from the back of a rabbit, Vasistha was born from Urvasi and Agastya was born from a pot. Apart from these personalities, there are many other wise persons born from other castes who became sages. Therefore birth does not make a brahmana." All the great historical personages mentioned above were not born brahmanas or had mixed parentage, yet they acted as spiritual masters to thousands of disciples. In more recent times, many Gaudiya Vaisnava acaryas who were not born in brahmana families have accepted the role of guru. These personalities include Srila Gadadhara Dasa Thakura, Sri Mukunda Dasa, Srila Narottama Dasa Thakura, Srila Syamananda Gosvami, Srila Rasikananda Prabhu, Srila Baladeva Vidyabhusana, Uddharana Datta Thakura, Srila Jagannatha Dasa Babaji Maharaja, Srila Gaura-kisora Dasa Babaji Maharaja, Srila Bhaktivinoda Thakura, and Srila Bhaktisiddhanta Sarasvati Thakura. Amongst the many disciples of Srila Sarasvati Thakura who were not born in brahmana families, but who acted as acaryas are such personalities as Srila A.C. Bhaktivedanta Svami Prabhupada, Srila Bhakti Pradipa Tirtha Maharaja, Srila Bhakti Vilasa Tirtha Maharaja, Srila Bhakti Kevala Audulomi Maharaja, Srila Bhakti Prajnana Kesava Maharaja and Srila Bhakti Kumuda Santa Maharaja. However, at least two stalwart disciples of Srila Sarasvati Thakura, namely Srila Bhakti Pramoda Puri Gosvami Maharaja and Srila Bhakti Dayita Madhava Maharaja were both born in illustrious brahmana families, yet they gave the power of succession to two of their senior disciples who were not born brahmanas, namely Sripada Bhakti Vibudha Bodhayana Maharaja and Sripada Bhakti Vallabha Tirtha Maharaja. It is also interesting to note that according to the memoirs of Sri Paramananda Vidyaratna Prabhu in Sarasvati Jayasri, (the first official biography of Srila Bhaktisiddhanta Sarasvati Thakura written during his lifetime), Srila Sarasvati Thakura visited the sripata of Srila Narahari Sarakara Thakura in 1912 and learned that upanayana and other samskaras were being performed since ancient times for vaidyas (ayurvedic doctors). Vaidyas were considered as sudras yet the descendents of Srila Narahari still initiated them with gayatri etc. This information was given to Srila Sarasvati Thakura by the mahanta of Sri Khanda, Sriyukta Radhikananda Mahasaya. It is also noteworthy that Srila Narahari Sarakara Thakura himself was not a brahmana, yet he gave initiation to Srila Locana Dasa Thakura who was born in a brahmana family. "Whatever a great man does, the world follows. Whatever standards he may set, the world follows in his footsteps." Thus the conjecture that converted brahmanas cannot function as acaryas has no basis in pauranika history or in the history of our sampradaya and thus the idea should be rejected. POINT 3) Actually, our guru maharaja (A.C. Bhaktivedanta Svami Prabhupada) appeared in the chain of the Brahma-kayastha family in the Dalabhya dynasty. I know this after learning of his father's last name and gotra. In Vedic civilization the Brahma-kayastha caste is equal to brahmana in every way. REFUTATION: If we accept the words of Srila Prabhupada (the guru of the author of 'guru nirnaya dipika' ) then we can only conclude from the above statement that the author of 'guru nirnaya dipika' is a victim of misinformation, or that he has deliberately fabricated evidence in support of his own theory. Srila Prabhupada has stated in various places that his family belonged to the suvarna-vanik community who were gold-merchants. Furthermore, his family gotra was Gautama and not Dalabhya and his father's surname was De, a prominent name amongst the mercantile class of Bengal. It should also be noted that Srila Prabhupada's spiritual master, Srila Sarasvati Thakura and Srila Bhaktivinoda Thakura both appeared in the kayastha community which in Bengal is considered to be a sudra caste. "I was born a descendent of Purusottama Datta, a Kanyakubja kayastha. Among the five kayasthas who came to the Gauda region on the invitation of Maharaja Adisura, namely Makaranda Ghosa, Dasaratha Vasu, Kalidasa Mitra, Dasaratha Guha and Purusottama Datta, Purusottama Datta was the foremost." Datta is a standard kayastha surname in Bengal and certainly not the title of a brahmana. If indeed Bhaktivinoda was a brahmana-kayastha, why does he not mention it in his autobiography. Why is there no reference to his upanayana ceremony in his autobiography, and how is it that we do not see him wearing a sacred-thread in any photograph? POINT 4) The translations and purports of my guru maharaja were dictated on a dictaphone, unless the tapes are produced, we must believe that the purports have been altered making it look as if anyone can become guru... English was his second language, and to understand his exact meaning one would have to refer back with him. The message given in these books is altered because of this lack of communication between the author and the editors. "So at the present moment, because these purificatory processes are not accepted, even in India... Accepted, they're unable. Everything has topsy-turvied. Therefore the sastra says that: "Accept everyone as sudra." Kalau sudrah sambhava. There is no more brahmana, ksatriya or vaisya. All sudras. We have to accept. Because no Vedic culture, no Garbhadhana samskara. They are born like cats and dogs. So where is this division? There cannot be. POINT 5) This verse (kiba vipra kiba nyasi...) is written in Bengali language. Sanskrit is the timeless, changeless, language of God. Nowhere in Sanskrit literatures is such a statement written pertaining to the initiating guru. REFUTATION: We must emphatically state that indeed Bengali is the language of God! Sri Caitanya Mahaprabhu Himself spoke Bengali and Bengali is spoken in the eternal Navadwip. The Caitanya-caritamrta written by Srila Krsnadasa Kaviraja Gosvamipada, the incarnation of Sri Kasturi Manjari, the intimate associate of Sri Rupa Manjari and Srimati Radharani, was written in Bengali. Any literature written by such an exalted personality, in whatever language, should be considered on par with the Vedas. To denigrate such a transcendental literature merely because it was not written in Sanskrit certainly betrays a lack of faith in the previous acaryas and in Sri Caitanya Mahaprabhu. Sanskrit is indeed an important language but it must be remembered that in the Goloka Vrndavana Krsna does not speak Sanskrit. Krsna speaks Vraja-bhasa. The author of 'guru nirnaya dipika' is of the opinion that Srila Prabhupada's purport to this verse (kiba vipra kiba nyasi sudra kene naya) has been hijacked by his unscrupulous and ambitious disciples. However, what the author does not seem to understand is that Srila Prabhupada's purport, like most of his purports to his books, is simply a summary of his guru maharaja's purport to the same verse. Herein we are presenting both the purports of Srila Sarasvati Thakura and Srila Bhaktivinoda Thakura below in both Bengali and English to confirm that Srila Prabhupada's purport is in harmony to that of his guru-varga. Varne brahmani huna va ksatriya-vasiya-sudra-huna, asrame sannyasi huna va brahmacari-vanaprastha-grhasthi huna, ye kona varne va ye kona asramei avasthita huna, krsna-tattva-vettai guru arthat vartma-pradasaka, diksa-guru u siksa-guru haite paren. Gurur yogyata kevalamatra krsna-tattva-jnatara upari nirbhara kare - varna va asramer upara nirbhara kare na. Sri Mahaprabhura ei adesa sastriya adesera viruddha nahe. Ei tatparyanusare Sri vVsvambhara Mahaprabhu Sri Isvara Puri-sannyasira nikata, Sri Nityananda Prabhu Madhavendra Puri Gosvami (matantare Srimad Laksmipati Tirtha) sannyasira nikata, Sri Advaita Acarya ei Sri Madhavendra Puri sannyasira nikati diksita hayachilen. Sri Rasikananda srotrabrahmane tarakulodbhuta Sri Syamanandera nikata, Sri Ganga-narayana Cakravarti u Sri Ramakrsna Bhattacarya srotrabrahmanetara kulodbhava Srila Narottama Thakurera nikata, katoyara Sri Yadunandana Cakravarti Sri Dasa Gadadharera nikata pancaratrika diksaya hana. Dharma-vyadhadi anekarata siksa-guru haybara vyaghata chila na. Mahabharatera spasta adesasamuha evam Srimad Bhagavate saptam-skandha ekadasa adhyaya 32 sloke - "yasya yal laksanam proktath pumso varna bhiv yanjakam, yadan yatrapi dris yeta tattenaiva vinirdiset" Ei vakye vidhilikh prayoge vaisnava-visvasanugamane krsna-tattva-vettara vrtta-brahmanatai svabhavika, sutaram kalipracalita srotra-sambandha vyatita brahmanata yekhane haite pare na, tat-sthale krsna-tattva-vitta haile srotra-sudra u sastriya brahmanata labha kariya guru haite paren - ihai Sri Mahaprabhu suksmabhave bujhaiya dilen. Ye sakala krsna-tattva-vita vaidika vajasaneya sakhaurgata katyayana grha-sutrakta savitrya-samskara grhana karena na, tahara - ekayana-sakhi daiksya-brahmana matra. Kintu nirboddha lokera tahardig ke aneka samaya 'acyuta-brahman' baliya bujhite na pariya nirayagami haya; tajjanya Rasikananda Prabhura vamsa, Srikhander Sri Mukunda Daser vamsa, Navanihodera vamsa savitrya-brahmana-samskara evam srotra-vipra-sisya-sampradayera acarya-karya avahaman-kala caliya asiteche. Bhajanandi vaisnava-gana savitriya-samskara grhana karena nai boliya ye ekamatra vidhi haibe, ekrupa nahe. Vaisnava-gana laksana-dvara varna nirnaya kariya thaken, kintu nirboddha-gana adrsa laksana dvara varna karate asamarta baliya Sri Mahaprabhu spstabhavei sastra-tatparya bujhiya dilen. Hari-bhakti-vilase samgrhita siddhanta Sri Mahaprabhura nija adarsacara u upadesera sahita eka haile u nirboddhera vicare bhinna boliya pratita haya. Ei sankhyadhrta 'guru' sabdetita tahara vicare sravana-guru, va bhajana-siksa-gurui udista. Diksa va mantra-data guru udista hana nai; kena na tahara mate vamsa-paricaya arthat rakta va sukrai divya-jnana-datara adhikara nirnaya u paricaya pradana kare. Sutaram suddhatma-vrtti krsna-bhati tahara mate nirapeksa nahe; visesatah diksa-guru va mantra-datara sresthatva u mahatmya tahara murkhatanusare 'sravana- guru' athava 'bhajana-siksa-guru' apeksa adhikatara! E-sambandhe adhi, 9m p. 41 sankhyara anubhasya visesabhave alocya. Vastutah eirupa dharana tahadera aksajajnanajanita aparadhera phala-matra. "The qualities that divide mankind into castes have been described, wherever those qualities are observed then the appropriate caste will be ascertained there accordingly. (Caste will not be ascertained by birth alone)." It is clear from the words of Srila Bhaktivinoda and Srila Sarasvati Thakura that any Vaisnava, irrespective of his birth and caste, is eligible to become guru if he has the necessary adhikara. The transcendental diksa-mantras are not the sole property of a particular class of men. Sri Caitanya Mahaprabhu has said that anyone who knows the science of Krsna is qualified to be guru. If one says that it is imperative that the guru must be born in a brahmana family, he has clearly not understood the science of Krsna consciousness and is therefore unqualified to initiate disciples. 1) According to the sastras and the previous acaryas, anyone who is a qualified brahmana, by birth or by initiation, may take up the responsibility of acarya. 2) There are numerous examples in history of persons appearing in non-brahmana families and converting into brahmanas, including Srila Prabhupada and other members of our sampradaya. Such personalities are qualified to accept disciples. 3) According to the Anubhasya of Srila Sarasvati Thakura, any person, whatever his birth, can become a diksa-guru if he is conversant with the science of Krsna-consciouness. The word 'guru' does not necessarily mean that a non-brahmana can only function as a siksa-guru. 4) Those scriptural verses which indicate that one should take diksa only from a person born in a brahmana family should be understood to be promoting Vaisnavism relative to mundane society. Those who desire pure bhakti may accept diksa from any advanced Vaisnava no matter what his caste may be. This is the conclusion of Srila Thakura Bhaktivinoda.